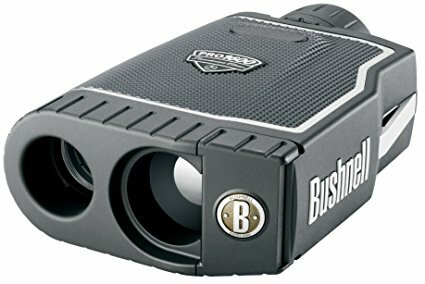 Just when golfers are starting to think that GPS has completely taken over the market, the distance-measuring devices got more interesting with the release of Bushnell’s strongest addition to their family of rangefinders – the Pro 1600. The number in its name indicates the distance that it can cover (in yards), which makes the Bushnell Pro 1600 the company’s most sensitive and most accurate rangefinder to hit the market. As Bushnell’s flagship model, it is also equipped with other powerful specs and features like the 7x magnification, PinSeeker technology, 100% waterproofing, fully multi-coated optics, built-in slope compensator, and more. The Bushnell Pro 1600 makes it easy to measure distances between you and 1600 yards away. This means that the laser rangefinder has no problem whatsoever with measuring pins from 250 yards away. Now you can rest assured that you won’t go wrong picking up flags from any reasonable distance. Made for the serious golfer, the Bushnell Pro 1600 has a plus / minus 1 yard accuracy. This makes it the perfect rangefinder for those who have tighter accuracy tolerances to improve their golfing game. The eyepiece of the Pro 1600 can magnify objects up to 7 times, making it perfect for scanning long distances. This is especially helpful on those second par-5 shots for instance, when you are trying to find a nice lay-up yardage based on the total distance away from the flag. Feel free to watch birds fly around the course to see how crystal clear the images remain even at that magnification level. When it comes to size, the Bushnell Pro 1600 proves that size does matter. Measuring a solid 7 x 26 x 6.5 inches, the horizontally-oriented unit makes it ideal for two-handed rangefinder use in order to eliminate the unstable, shaky operations with one hand. It is also substantially heavier than the vertical Tour V2, but with one touch, its sheer weight and feel makes it evident that the Pro 1600 is sturdy and made to last years of use. Multi-Coated HD Lenses with Rainguard Coating – this brings exceptional brightness and clarity to every scanned image – even when using the device while it’s raining on the course. Pinseeker Mode – the Pinseeker technology allows better accuracy when scanning. This results for easier flag acquisition without capturing background distances unintentionally. Scan mode – the standard scan mode makes it possible to look around the course while keeping track of the scanned distances between you and the flags that are continuously displayed on the LCD. The built-in slope compensator allows for the elevation changes in the landscape. The digital inclinometer of the Pro 1600 will let you find out distances depending on the elevation change degree, resulting in safe and smart swings. The Bushnell Pro 1600 passes the waterproofing standards of IPX7. Its 100% waterproofing makes it submersible in water and can even float despite its seemingly weighty appearance. Not that you should try floating it in any of the water hazards, but if it did happen to fall in, or get soaked by a heavy downpour then it will be completely protected. With an extended 9 volt battery life, you don’t have to carry around a separate, fully-charged battery pack in your back when on prolonged games. The Bushnell Pro 1600 comes with a 2 year limited warranty. Being able to compensate for any changes in elevation is that makes the Pro 1600 stand out from all of the other rangefinders. Even a slight elevation is going to cause a difference in the distance and ultimately the club that you hit. So if you play on a course that is not entirely flat, you really should consider the Bushnell Pro 1600.